A river herring floats down the Penobscot River on Wednesday, May 30, 2018. Thousands of the herring died after a drawdown of the water level at the Orono Dam on May 24. The planned annual lowering of water levels on the Stillwater branch of the Penobscot River caused the death of thousands of river herring — and one Atlantic salmon — last week, but a state official said the impact on the thriving herring resource was minimal. Brookfield Renewable, the company that manages the Orono Dam, which is just downstream from the bridge on Main Street in that town, said it conducted a planned three-foot drawdown of the Orono impoundment on May 24 in order to make upgrades to the dam. The company installed flashboards to raise the effective height of the dam, as well as barriers to keep boaters out. River-watchers along the main stem of the Penobscot later saw dead fish floating past, or ending up high and dry at low tide. That rescue crew found thousands of fish stranded below the dam. Some were rescued, while others were already dead. “As a result of the reduced flows during this work, some fish mortalities occurred downstream of the Orono Dam. 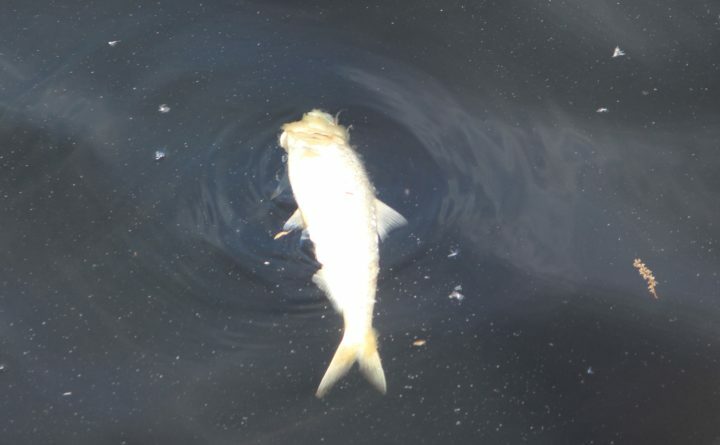 Once Brookfield became aware of the situation, we immediately sent our fisheries crew to the scene to rescue the fish that remained stranded in the pools below the dam,” Samantha Edwards, the manager of stakeholder relations for Brookfield said. The bulk of the fish that died were alewives, or river herring. One Atlantic salmon also died, and Edwards said Brookfield Renewable informed the pertinent fisheries agencies of the event. Atlantic salmon are federally listed under the Endangered Species Act in all Maine rivers. “Our fisheries staff was able to save several hundred fish,” she said, adding that the company has been working with local officials to clean up the remaining dead fish. Despite the deaths of thousands of river herring, Pat Keliher, the commissioner of the Maine Department of Marine Resources, said the incident wasn’t a threat to the species itself, which has flourished on the Penobscot over the past several years. Edwards said Brookfield takes the situation seriously. “We are conducting an internal review to avoid a similar incident in the future,” she said. Alewife restoration efforts on the Penobscot mean that there are more fish in the river, forcing Brookfield to adapt how it accommodates them.